A three-year-old SA boy is the latest child to die in South Africa after drowning in a pit latrine. Omari Monono died in the outside toilet at his aunt's house in Limpopo province, the same region where five-year-old Michael Komape drowned in a school toilet in 2014. "I'm hurting. I cannot eat or sleep," Omari's mother, Kwena Monono, is quoted by IOL news site as saying. "Every time I see something my son loved, my heart breaks and I just cry." She says her son "was pulled out of the toilet head-first at about 16:00 (14:00GMT) on Wednesday", having gone missing two hours earlier. Police say the boy's aunt called for help when her own search failed. "His aunt took off his clothes and left him to relieve himself outside the toilet as usual. She was busy with her house chores when she noticed she had not seen the toddler for some time," police spokesperson Constable Maphure Manamela said. A police inquiry is now under way. 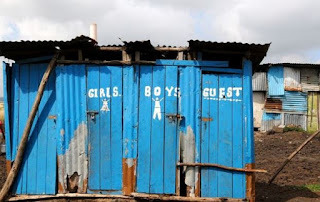 What are pit latrines? Pit latrines, sometimes called long-drop toilets, are a type of toilet that collects faeces in a hole in the ground. They are classed as basic sanitation. Yet an estimated 27% of South Africans do not have access to even basic sanitation, according to the charity Water Aid. That is slightly lower than the global average of one third. The UN defines basic sanitation as: About one in five South African schools have pit latrine toilets. Human rights law firm Section27, which is representing Michael Komape's family in their appeals case for 3m rand ($221,000; $166,000) in damages, have called this latest death "very tragic and sad". Spokesperson Zukiswa Pikoli said Omari's story "reinforces the need for eradication of pit toilets and the provision of safe and adequate sanitation". Earlier this year in the rural Eastern Cape province, a five-year-old girl drowned in a pit latrine. Lumka Mkhethwa went missing without a trace from Luna Primary School in March. A pack of sniffer dogs found her body at the bottom of a dark, faeces-filled toilet. After Lumka's death, President Cyril Ramaphosa called for pit latrines to be eradicated from South African school by the end of 2018.